Allison Iraheta was eliminated on May 6th 2009 from American Idol season 8. She made it all the way to the top 4 but on results night it was her time to say goodbye and go home. This season was labeled the guy’s season early on. When they decided not to have equal gender participation in the semi finals, it was clear that the public had a preference for guys since only three women made it into the top 13 with votes alone, the other two needed the wildcard to be admitted in. The results are in. After the nationwide vote Allison Iraheta is sent back home. Though it’s probably too late for her to go back to school. I’m not sure if I can say there was any suspense tonight. It was clear that in spite of what the judges had to say there were only two people at risk of going home, Kris Allen and Allison Iraheta. If we are to learn the lessons from last season and from the semifinals in general, it is clear that American Idol’s audience is made up mostly of females who love so-called cute contestants. And that is why I was pretty sure Allison was the one going home. Kris is cute Allison isn’t. I’m not saying that Allison is ugly not at all, and she also seems like a nice and cool kid but she lacks that force of attraction found in people like Kelly Clarkson. The same can be said of last year’s Sayesha Mercado. Those are people that would have never won American idol no matter how far the advanced in the competition they were bound to loose to a cute guy! Kris Allen probably picked up the votes of Anoop Desai’s fans. He did have his own fan base but I don’t see the people who liked Anoop voting for Adam or Allison, they might vote for Danny Gokey as well. 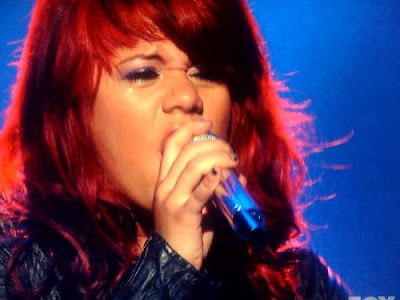 This entry was posted in Allison Iraheta, American Idol, American Idol results, American Idol season 8 by admin. Bookmark the permalink.